A selection of some of the projects and events that I have been involved in over the past few years. An exhibition of forged metal sculptures showing works by a group of 15 international artists. The exhibition was curated by Delyth Done in collaboration with Ruthin Craft Centre. It debuted at Ruthin and then toured to another 4 venues. Being invited to participate in this project gave me an incentive to dedicate focussed time to realise in finished form some ideas I had been experimenting with. Although much of my time is spent working to commission on architectural metalwork, sculpture remains integral to my working practice. Through sculpture I am able to explore the possibilities of forging forms in steel unconstrained by the necessities of function. In particular I seek to express the growth, movement and latent energy in plant forms; focussing on the logic and progression in components in relation to overall form. In the Spring of 2017 I was approached by the organisers of the ‘Ferrous’ festival to help create a focal work for the festival. 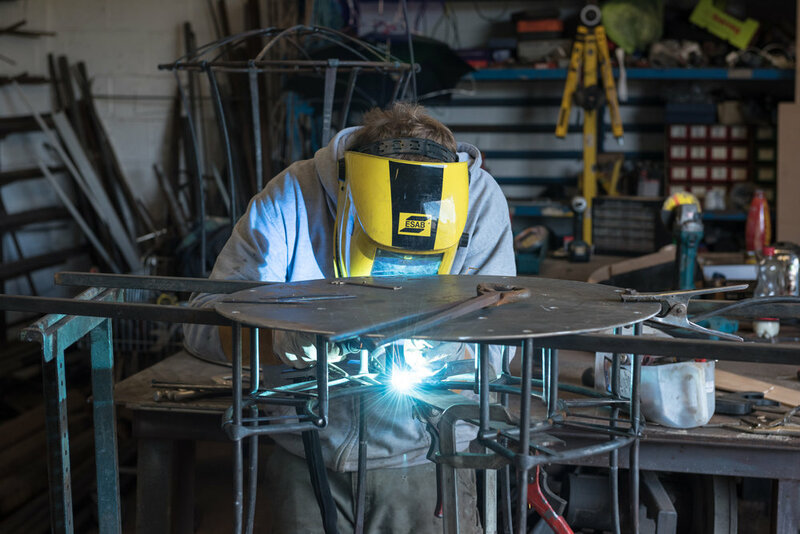 They wanted to not only provide a showcase for blacksmithing in Hereford, but to also to create a project that had resonance for the local community and that could allow Herefordians and visitors to the festival an opportunity to participate too. It was decided to work in collaboration with St Michael’s Hospice (www.st-michaels-hospice.org.uk), a local organisation whose work has deeply affected many members of the community and I started the project by visiting the hospice and talking to staff. The Gingko Arbour design was initially informed by the site where it is to be placed in the grounds of St Michael’s Hospice. The first consideration was scale; it needed to be a significant size to be a visual draw across the grounds to an area of the gardens that is quiet and invites thoughtful seclusion amid the rural landscape. It was decided to create a seating area that can accommodate individuals and small groups in an intimate space; something classic and elegant, with an emphasis on simplicity and purity in the forging. A circular structure lends itself to people being able to gather in conversation whilst being able to gaze outwards to the surrounding countryside. The circular shape also alludes to an embrace which is a theme that I have further pursued through the methods selected to fasten the structural elements together; each element of the structure supports another, wrapping around one another, holding onto the next. Initially I made a scaled maquette to resolve the design. Another key feature was to create a design that enabled open collaboration with members of the public as part of the production. To this end, I looked for a motif that could be repeated, a decorative feature that could be achievable for anyone to forge no matter what their skill level. Looking for shapes in the botanical, I was drawn to the Gingko leaf, with its symbolism of longevity, endurance and hope, combined with its aesthetic appeal and forgeable shape. 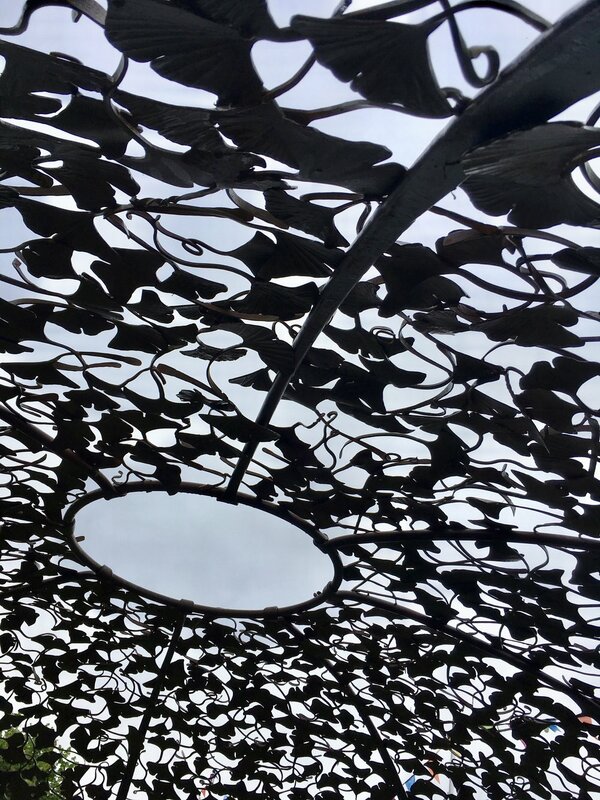 Hundreds of leaves have been connected to make a porous canopy covering the top of the arbour. The repeated leaves each the same, but each one individual; bearing the marks of the people that made them – a metaphor for us all and making this work a piece not about individual loss but about a shared experience that we all go through in some way. The work is to be installed Autumn 2018, however, it has been on visits to High Town, Hereford for the ‘Ferrous Festival’ and to the Hay Festival of Literature. During the last two weeks of October the City of Hereford played host to a festival of blacksmithing. An ambitious project devised by Delyth Done (Hereford College of Arts) and Georgia Smith (Hereford BID) to celebrate the county of Hereford’s rich metalworking heritage and showcase the best in contemporary practice. The key events of the festival included: two exhibitions of work by an international collection of smiths, ‘Forge’ @ Hereford Museum & Art Gallery (for more details see above) and ‘Transition’ @ Hereford Cathedral (originally shown at Ypres, Belgium - see September 2016 entry below). A display of photographs by Oliver Cameron-Swan documenting the process of making the Gingko Arbour was also shown at Hereford Museum & Gallery (examples included in the images for the Gingko Arbour project above). An exhibition of works by local blacksmiths & from the Hereford Museum collection were displayed in the museum and shop windows around the centre of Hereford. At the heart of the festival was a live forging event where over 3 days 6 forges were set up in the city’s pedestrianised High Town. 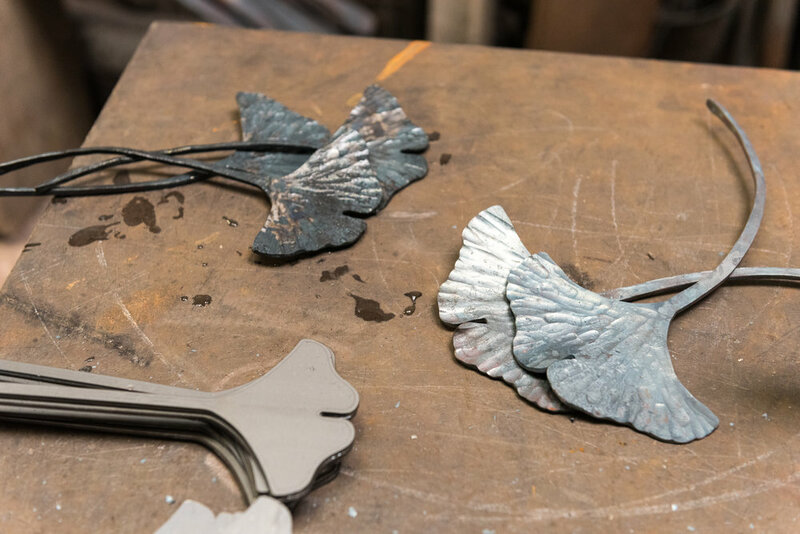 Members of the public, under the guidance of blacksmith students of HCA/Herefordshire & Ludlow College, had the opportunity to forge a Gingko leaf to be added to the canopy of the Gingko Arbour for St Michael’s Hospice. (More details about the Gingko Arbour above). 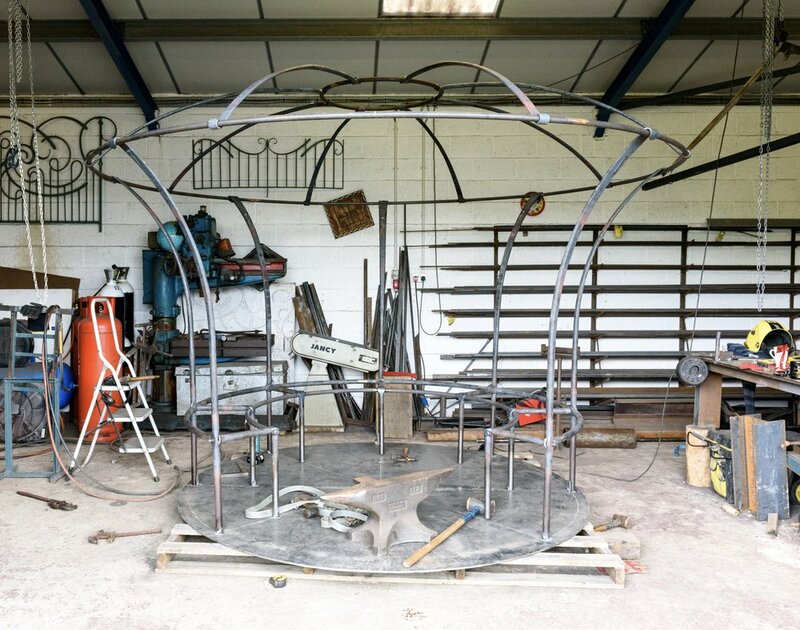 It was a busy event for me, I had been working over the summer to produce the Gingko Arbour structure as centrepiece for the live forging event. During the festival I showed work at both exhibitions (which I helped to install) and was forge master for the live forging event. A hugely rewarding project to be part of as maker and watching my students excel in their roles installing and manning exhibitions, setting up the forge facility and engaging with participants forging leaves. The second weekend of the Ferrous, the festival and Hereford College of Arts hosted the annual British Artist Blacksmithing Association meeting, attracting over 100 UK members to enjoy the festival with presentations from US blacksmiths - Christoph Friedrich, Professor Richard Smith & Patrick Quinn and myself. Attending this year’s event not only had the great experience competing against a host of talented blacksmiths from around the world, but had the honour of captaining the winning team! Team-mates Matthew Garton, Sam Pearce, Victoria Gaskill and I are the current blacksmithing WORLD CHAMPIONS!!! 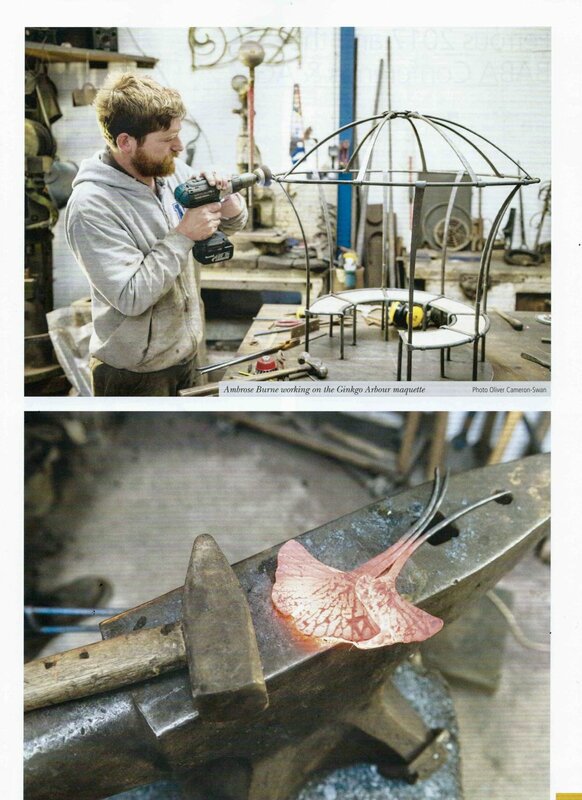 I am very proud to have been part of this exceptional project organised by ASG (Belgian Blacksmithing Guild) and BABA (British Artist Blacksmithing Association). The aim of the project was to draw together international blacksmiths to make the first international war memorial, commemorating the soldiers of all nations who took part in the Great War. It also commemorates the pacifists who objected to the conflict and greatly suffered for their beliefs. The memorial consists of 24 forged metal panels surrounding a large core 10 cenotaph and a field of metal poppies. I submitted a proposal design for one of the 12 forged panels that were selected by the organising committee, I was delighted to be chosen. Ypres is a place of remembrance for people from many nations, so I aimed to design a panel that didn’t allude to the British, but addressed all those involved in this devastating conflict; irrespective of ‘side’. I began by looking at the Western Front, the main arena of the conflict. It surprised me how little movement there was along this line during the 4 years of war, this seemed to succinctly illustrate the futility of this particular conflict and war in general. I also considered the role of the blacksmith in this situation, the producer of tools that enabled the digging of the trenches that created the physical landscape particular to this war. I chose forged picks that would have been standard issue to troops on both sides of the conflict that would have been used as trenching and tunnelling tools. In my design I chose to represent the Western Front through a line made by threading the forged pick-heads on to round bar so that it also alluded to barbed wire, each pick-head denoting a major offensive on the front. Barbed wire was developed in the 19th century for enclosing livestock, but was soon adopted as a military barricade; the deployment of barbed wire escalated during WW1 and has become one of the most potent symbols of the inhumanity of the war. The use of barbed wire was one of the main reasons that this war stood in stalemate for so long. The line is also similar to a stitched wound and evokes the scar that the Great War left in human consciousness. 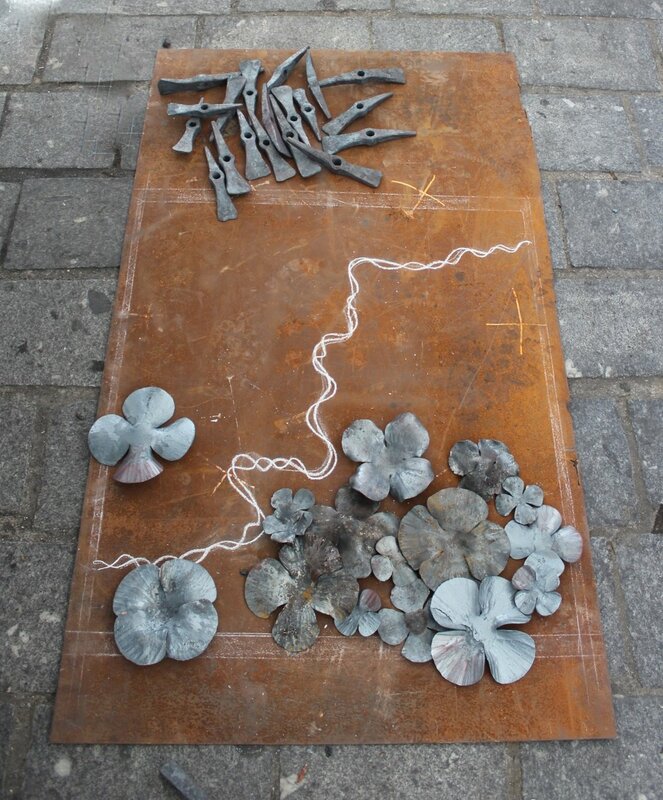 The panels were made as part of a live forging event held in the Grote Markt in the centre of Ypres. I headed up a team of smiths and together we produced the panel over two days. The completed works are now on permanent display at Langemark-Poelkapelle next to the German cemetery. During the forging festival there was also a selected exhibition of forged metal sculptures made on the theme of 'Transition'. I participated with a sculpture entitled 'All the Same'. 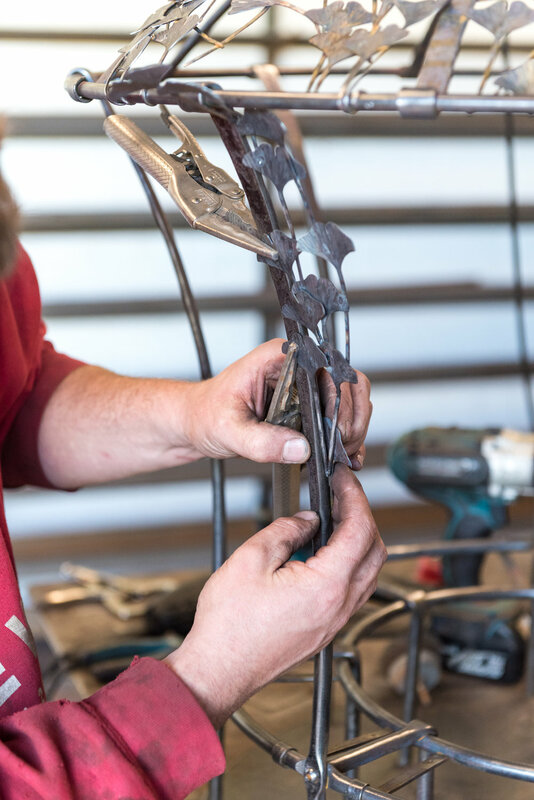 The work is a tableau of 6 elements made from identical pieces of stock, 150mm of 25 square bar that display the fundamental processes of blacksmithing: drawing down, fire weld, punch & split, fuller & spread, upsetting, drawing down & bending. Returning again to Stia for the World Forging Championships. This biennale I acted as striker for colleague Sam Pearce, assisting him in the solo competition. First Prize!! The annual gathering of British Artist Blacksmiths was this year a 3 day event at Yorkshire Sculpture Park. In honour of the host site, a live project was set by the organisers inviting 5 smiths to team up with a maker from another craft discipline in order to make a collaborative sculpture. 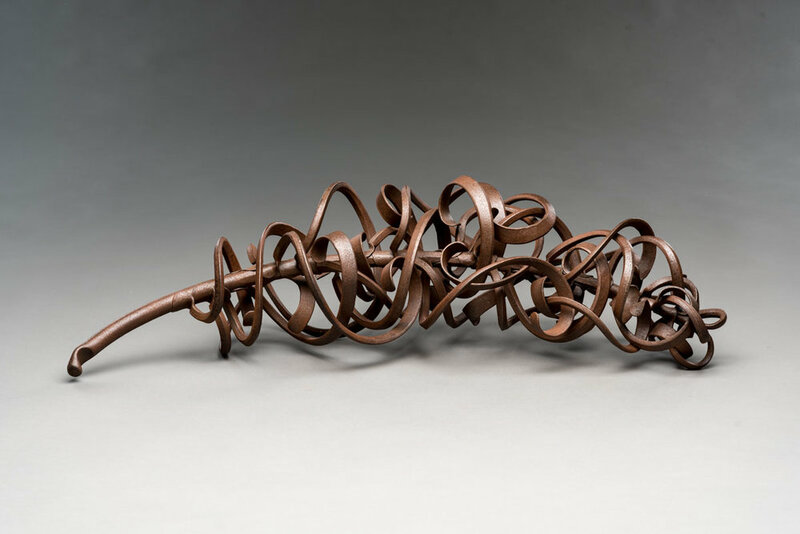 I teamed up with smiths Matthew Garton and Maxwell Anderson for the forging and Steve Pickup and Carine Van Gestel from The Willow Bank (www.thewillowbank.com) brought the practice of free sculpting with willow to combine with the forged work. We had a loose objective of form based around the structure of shells and seed heads, though much of the magic seen happened in the making over the 3 days. We were so pleased with the results that we plan to collaborate further. The AGM had a programme of talks to which I also contributed. I delivered a one hour illustrated talk on the subject 'What's the Point in Forging', perhaps a strange and controversial proposal, particularly to an audience of blacksmiths! My intention was positive. This is a question I often ask of myself given that there are alternative production methods for many of the works that I make, however, for me (and the other smiths) the result of the talk was an affirmation of practice and a positive boost to the continuation of our craft. A four day international forging event at which I headed up a team of 6 smiths, (Sam Pearce, Matthew Garton, Maxwell Anderson, Christian Vaughn-Jones, Aran Lang) competing in a live forging competition and flying the flag for Wales. We had 8 hours to produce a panel that, along with the panels of the 7 other competing teams, is part of a stretch of railings at the Devon County Showground. The panels' themes were to reflect the Showground's activities, our panel represented 'Country Living'. We came 3rd! Sam Pearce, Edward Blower and myself entered into the team competition for the 20th World Forging Championship at Stia. We had 3 hours to produce a piece of work to the theme 'Plasticity'. We designed a visually playful sculpture that demonstrated some of the principle processes involved in forging, It was called '250mm x 4', as we started with 4 pieces of stock metal measuring 250mm. Our team came 2nd (out of about 50 and up against some pretty stiff competition). A very proud moment. 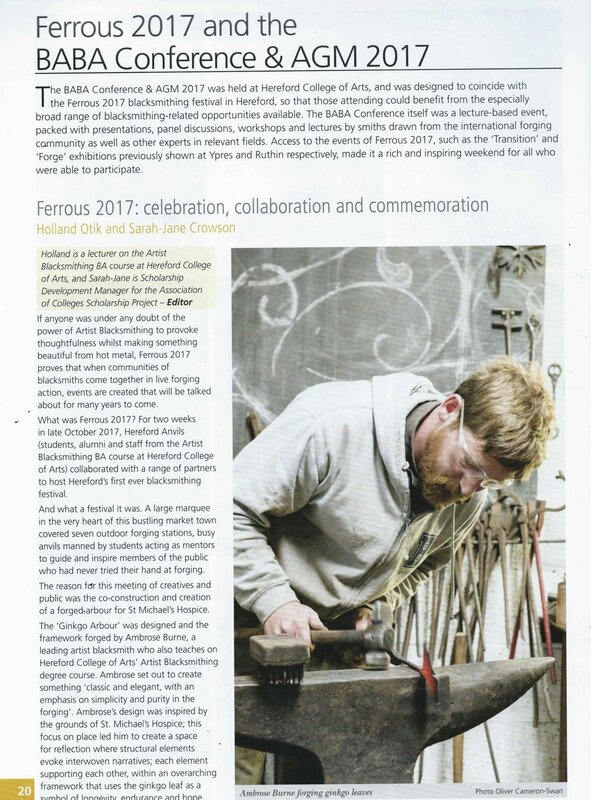 'Forged: 20 years of Artist Blacksmithing @ Hereford College of Arts' was an exhibition staged in the college atrium to celebrate 20 years of delivering university level artist blacksmithing at HCA with works from 20 of the colleges' alumni. I had the opportunity to be involved in this project from its genesis, assisting Delyth Done (HCA Programme Manager of Higher Ed. courses/Course Leader Artist Blacksmithing) in the organisation and curation of the exhibition. I was also one of the exhibiting artists and contributed an essay to the exhibition catalogue. The opening of the exhibition coincided with the annual BABA AGM held at the Holme Lacy Centre for Rural Crafts. In addition to the 'Forged' show, I curated an exhibition of work contributed by the BABA delegates and gave an illustrated talk on works I had made for an ongoing commissioned project for a client's French garden. I attended the biggest annual forging festival in the Ukraine (out of about 10 festivals!) as part of a group representing Hereford College of Arts. 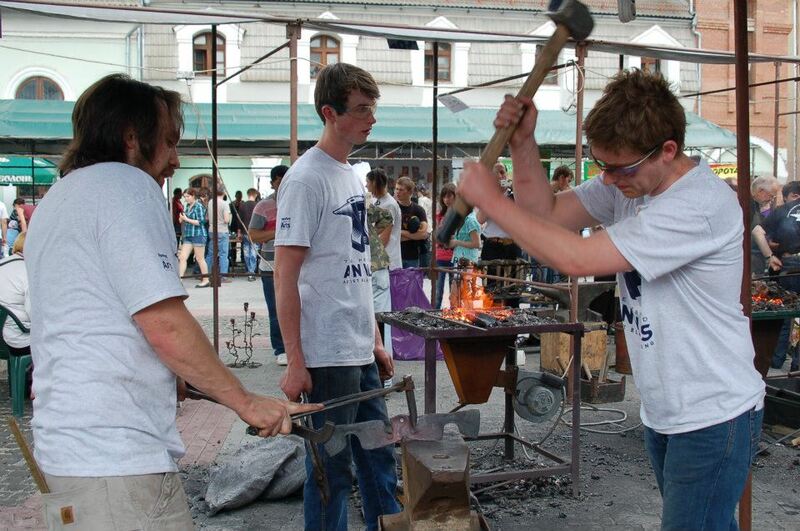 This event saw the genesis of the Hereford Anvils, the moniker for HCA exhibition blacksmithing team. Alongside HCA Programme Manager Delyth Done, I led a cohort of students -Edward Blower, Simon Bushell, Sam Pearce, Robert Thomas - joining in the team competition in the festival, each team had hours to make a forged bell which was to be incorporated into a large sculpture where the town's first church once stood, the sculpture was to commemorate the founding of the city. The Hereford Anvils won the highest commendation of the Golden Anvil for our sculpture.